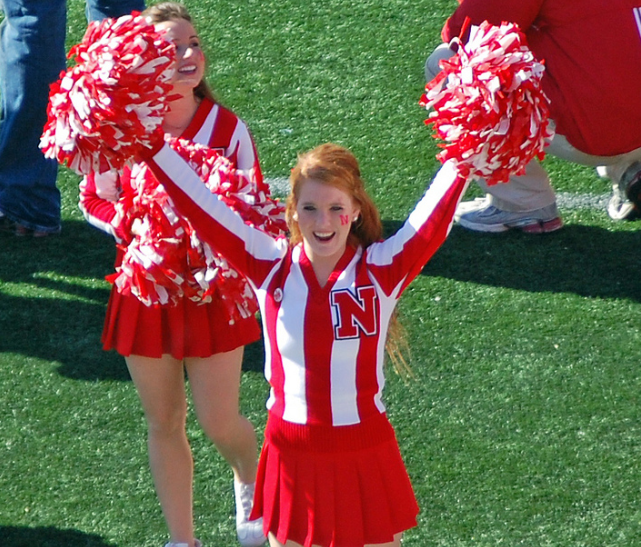 So where do you suppose one shops online for an extra-large Nebraska cheerleader uniform anyway? I wish I was asking because I’m buying someone a gag gift for Christmas, but alas, my big mouth and lack of basketball smarts just may have gotten the best of me. I will go on record right now (seriously, print and save this column) saying if Iowa indeed finishes eighth or lower I will attend Iowa’s last home game in Carver Arena in a Nebraska cheerleader uniform and let Tom Kakert post a pic of it on this webpage. Saturday, as my wife and I sat in Carver watching Iowa get tantalizingly close to hot-shooting Penn State over and over only to throw a ball away, commit a dumb foul or take an ill-advised shot on the way to a dispiriting loss, the reality hit me like a blast of frigid water. I might actually have to make good on this bet. I might also go with vertical stripes; I hear they are slimming. Watching Iowa play basketball, I am flummoxed and confused wondering how a team that showed flashes of brilliance at times last year has fallen so far. Peter Jok was a heck of a basketball player,but at no time last season did I ever feel like the Hawkeyes were a one-man-band basketball team. I’m guessing that my biggest mistake was not listening to those who insisted guard play would be a gigantic problem for this team. Yes, I know that great guard play is the engine that drives excellent college teams. However, Jordan Bohannon was one of those aforementioned All Big 10 Freshman players and I still think the kid is going to be a star on the Big 10 stage. But clearly, he needs help. It hasn’t helped that he is missing fellow point guards Christian Williams and Connor McCaffery to a transfer and mononucleosis, respectively. And although he plays primarily small forward, the absence of a healthy Nicholas Baer also is putting padded pressure on Bohannon. Most of all, though, it seems obvious now that the presence of the sharp-shooting Peter Jok took a ton of pressure off Bohannon and he’s struggling mightily to cope with that now. He is clearly pressing and there is no cavalry coming to save him anytime soon. That said, despite his stellar sharpshooting and addition of the dribble-drive to his arsenal as a senior, Jok was never an A+ defender. In fact, it is probably pretty charitable to call him anything more than a capable defender. And horrendous defense is the Achilles Heel killing this current Hawks basketball team. It almost seems like a case of a collective sophomore slump, with the actual sophomores in particular struggling to regain the confidence they showed as freshmen. With a lack of upper classmen leadership and their fellow young players struggling, the current crop of freshmen look a bit lost as well. Particularly alarming, though, were the spurts of apparent laziness and lack of hustle during the Indiana game. While it’s understandable that the recent run of poor play has frustrated Iowa players, there is absolutely no excuse to not give 100 percent, no matter the game circumstances. That is the only way to break a slump or build for the future. All the problems and frustrations aside, I’m still extremely bullish on the Fran McCaffery blueprint for the Iowa program and optimistic for the future. I and many others may have been a bit premature to expect this group to compete at the top half of the conference this soon. But with the recruits currently in the pipeline and the raw talent already on the floor it’s hard not to anticipate big things. We are just going to have to add a heaping helping of patience on top of the optimism. This entry was posted in Tuesdays with Torbee and tagged bad bets, Iowa basketball, tuesdays with torbee by Tory Brecht. Bookmark the permalink. What after 8 years of Fran makes you bullish on his blueprint? The progression as a program has flatlined the last few years. After 8 years on the job KF had 3 top ten finishes and a couple conference titles. So why does everyone pile on him so much while Fran seems to continually get a pass?